Southerly winds will boost our high temperatures back into the 80s Sunday and Monday of this week. BIRMINGHAM, AL (WBRC) - WHAT TO EXPECT OVERNIGHT: Our stretch of tranquil fall weather continues this evening, although it is feeling a bit milder. We are tracking a cold front that will impact the state over the next two days and this may bring a few isolated showers to our far northwest locations, like Lamar, Marion, and Winston counties overnight. 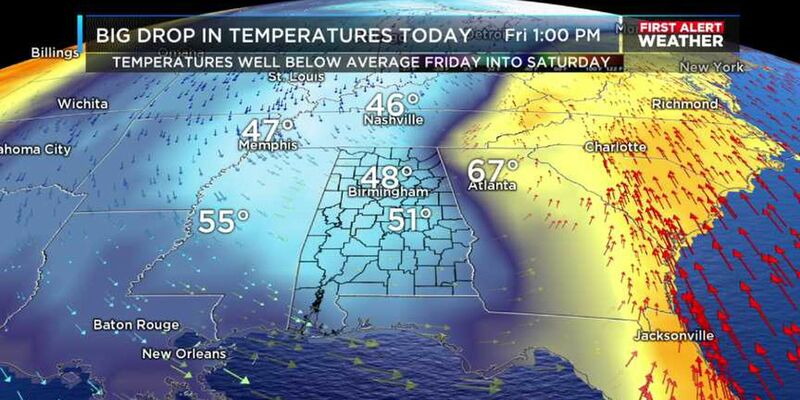 Most areas will remain dry, with lows in the mid-60s; about 5-10 degrees above average. Otherwise, you can expect a partly cloudy sky, with a continuing chance for a few showers in northwest areas to start the day on Monday. 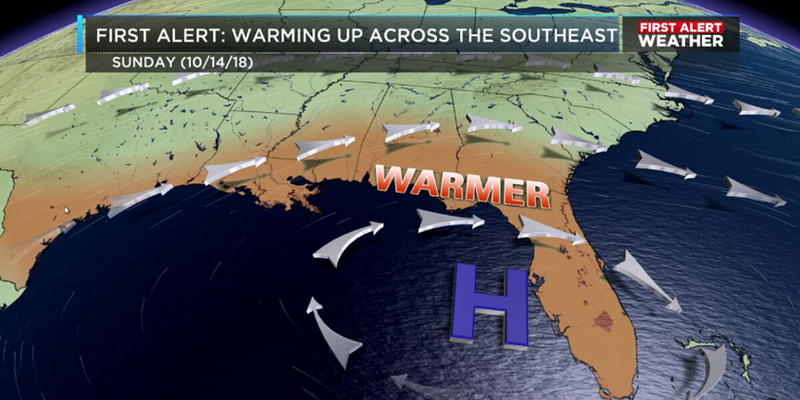 FIRST ALERT FOR A COOL/RAINY SETUP BY LATE TUESDAY: A south wind has returned to the area and this flow will become northerly on Monday as a cold front arrives. A few scattered showers will be possible on Monday, especially north and west. A storm can’t be ruled out but the chances for thunder will remain low. We will keep a small chance of a shower in the forecast through Monday night, with lots of clouds overhead. The cold front will settle to our south on Tuesday, however moisture will continue to overrun the state through Tuesday night. This will set the stage for a much better chance of rain Tuesday evening. And with temperatures tumbling into the 50s, this will be a chilly rain setup for late Tuesday and Tuesday night. I can’t rule out a few rumbles of thunder. The dry air will settle in early on Wednesday, with gradual clearing; highs will tumble into the 60s, with lows back in the 40s. THE LATE WEEK SETUP: We will enjoy lots of sunshine and cooler fall weather through Friday and then another cold front will impact the state. 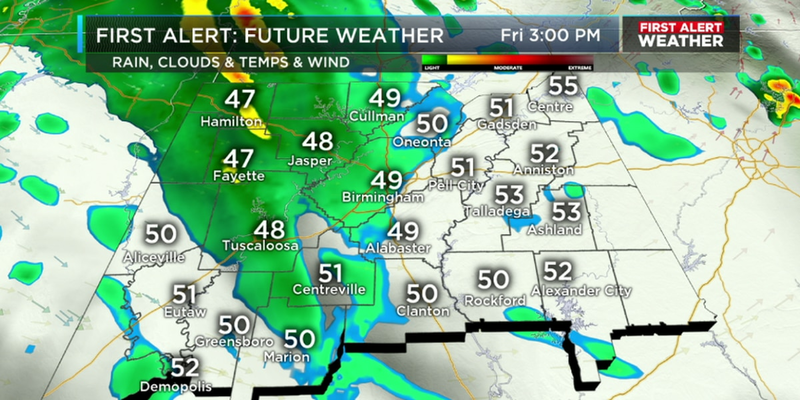 This cold front will bring a few showers and possible storms Friday night and into Saturday morning. We will rapidly clear out by late Saturday, with more sunshine and another surge of cooler air to close out the weekend. There has been talk of another tropical system taking shape in the Caribbean. There is a 20 percent chance of development within the next five days. However, this system is moving towards the Caribbean, so this week we are not expecting any major tropical systems to take shape and threaten the coast. There is also a system crossing the Atlantic, about 800 miles east of Guiana. This system has only a 10 percent chance of becoming better organized within the next five days. The Atlantic Hurricane Season runs through the end of November so we will continue to monitor closely for possible development over the coming days. 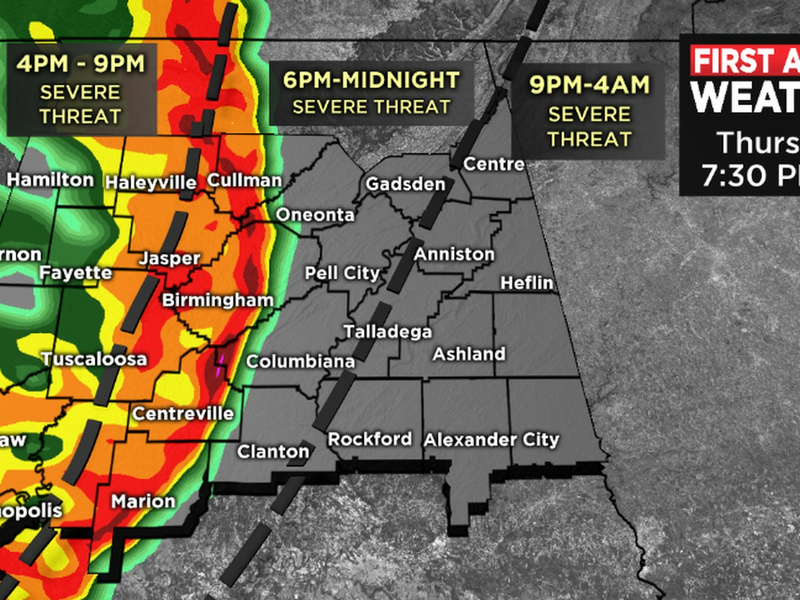 I will be sure to share updates on our WBRC First Alert Weather App. You can download our app for FREE by searching WBRC in your App Store. 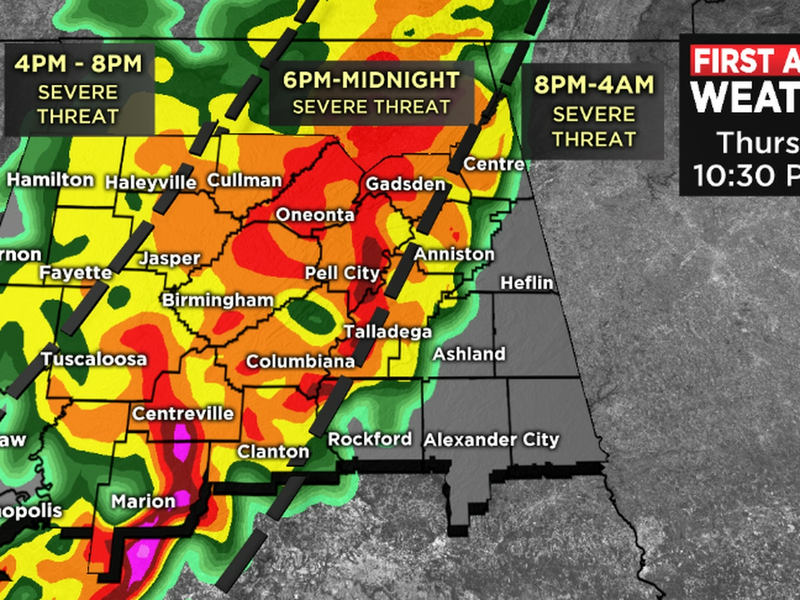 I will also have lots of updates in the show tonight beginning at 9 p.m. on FOX6 WBRC! Matt Daniel joined the WBRC First Alert weather team in August 2018 as a digital meteorologist/weather producer. Temperatures tonight look to dip into the lower to middle 40s and so you'll want to adjust the thermostat upwards. On top of the cloudy and chilly conditions, we will also have to deal with very breezy conditions.